If you've been asking yourself about why it seems that we just can't get it right in our relationships, and you want more, this is the blueprint to help you navigate during your search. In this book the author uses his life experiences, and those of several men and women of different ethnicities, ages, and cultures to give relationship advice to both sexes. The author has travelled to over 25 countries and put together over 5 years of research to discuss these topics. The Truth provides answers to today's most pressing issues about relationships, and lays out the roadmap to help you navigate. This book will appeal to readers interested in relationship self-help books. 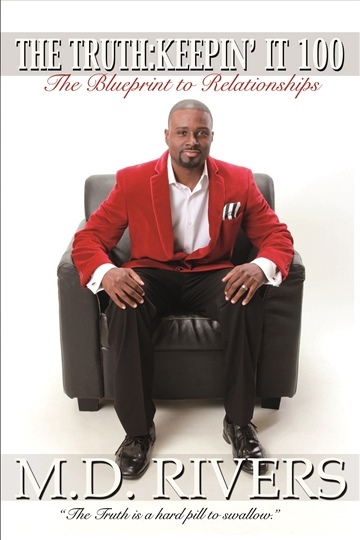 The Truth: Keepin' It 100 - The Blueprint to Relationships by Mario Rivers is an intelligent book for those who want to develop deep and meaningful relationships and learn how to make them last. In the heart of the book is the powerful message that truth saves, that it simplifies things, and creates the foundation on which trust is built. Rivers draws inspiration from firsthand experience in marriage and interviews with couples at different stages of their relationships to offer a timeless gift of advice that every couple will find useful. While this book can be an eye-opener for many couples with shaky relationships, it will be a gentle reminder to those who have found true love to not be negligent about the values that make it last. Rivers writes with confidence and simplicity, and his expression flows very naturally. The book reads like a heart-to-heart conversation with a sympathetic author. Readers at different stages of their relationships will find something to take home in this book. Rivers has intelligent advice for singles considering a relationship, young couples, and married people who are struggling to make things work. From handling the negative thought patterns that can sabotage a relationship to taking care of self and embracing the truth of who we are, Rivers comes across as an expert in the area of relationships. His language is simple and clear and will appeal to readers of different ages. The Truth: Keepin' It 100 - The Blueprint to Relationships is one of those books that will provide a roadmap for those who want to create meaningful relationships, a practical companion for anyone who wants to take their relationship seriously. This book received 5 Stars!